Instructors will provide guidance on the students' assigned homework. The instructors will encourage students to improve their time management and organization skills. Students have direct instruction on ways to improve word study skills, grammar usage, comprehension, and fluency. Students hear and read multicultural stories that are used as a spring board to illicit conversation and the exchange of ideas. The genre readings influence the individual and group writings of the students. The students also create authentic samples of food to share. In addition, the students are scheduled to visit the local Mount Vernon Library to encourage opportunities to enhance literacy skills, as well as incorporate computer literacy with their individual presentation. • Grades K-l listen to and read a variety of children's stories and have a unit of study on Poetry. They perform dramatizations based on the stories and poems read. cross-curricular themes explored throughout the year. Students are introduced to the "fundamentals" of computer literacy. The students learn the techniques needed to create and explore computer literacy that engages students in cross-curricular enrichment activities. A study of current events, as well as, African American leaders, scientists, activists, inventors and heroes are presented. Each study is followed by comprehension questions, which invoke thought-provoking discussions. In addition, their efforts are rewarded with certificates of participation and history sharing celebrations! Mae Carol Jemison, physician and the first African American woman to travel in space. 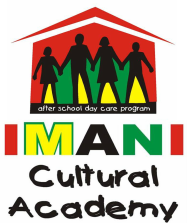 Click here to learn more about Extra-Curricular Exploration with IMANI Cultural Academy!